Complete Tri Seal tray line consisting of Adco, Model AFCXS-50-1-WD automatic, single head tray former and Adco Model 16B-50-WD, hot melt glue tri-seal carton sealer rated from 5 to 30 cycles per minute with number of trays per minute – depending on materials and application. Tray size range: 3" to 17" in Length; 4" to 8" in Width: 3/4" to 4.5" in Height. Capable of handling flat blank sizes up to 26" in Length and 23" in Width. tray former has 24" long blank tray magazine, dual vacuum suction cup recipicating pick-in-place, mechanical tray forming heads, no tray / no form photo eyes with Nordson hot melt glue unit and vacuum system. 48" long, servo driven, single chain lugged feed conveyor with 1½" high lugs set on 24" centers feeding to 11¾" wide x 124" long intralox table top product operator hand load conveyor into continuous motion, lugged, tri seal carton closer with 60" long dual lugged chain feed conveyor set on 24" centers has 2" wide x 2-1/2" high lugs with 90-degree tray rotation section, to 132" long dual chain transport conveyor set on 24" centers with 60" long dual top flap and side flap closing and sealing conveyor with 22" long side compression section. Nordson hot melt glue and vacuum systems with seko gauges. Both have control panels with A/B controllers and touch pad controls. Both mounted on heavy duty base frames with leveling legs and cage style interlock safety guarding. Complete food processing line with stainless steel contact parts put together by Loos Machine and Automation. System starts with a wagon tote dumper that discharges into an inclined screw conveyor. The inclined screw meters the product into an Urschel, Model 1700, reduction mill. Complete line system controlled with an AB PLC. Kalish Mono-O-Count stainless steel complete tablet / capsule filling line rated from 5 to 50 container per minute – depending on materials and application. 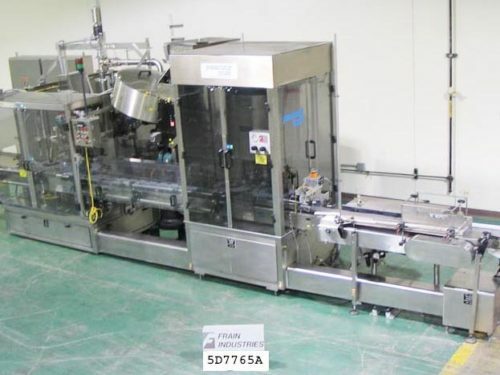 Line consisting of Kalish Kalisort 60 bulk bottle unscrambler, Kalish Swiftpak 12 track tablet-capsule counter, Kalish cottner, Kalish Capper, with interconnected conveyor. The Mono-O-Count system requires a minimum amount of space, confiqured in U-shape there by reducing manpower needed to operate the line. Complete paste filling, capping and labeling line with number of containers per minute – depending on materials and application. Line consist of MRM Model RPF-8 (8) head L to R rotary piston filler with fill range up to 35oz with accuracies of +/- 1/4 of 1% depending on product. Container: up to 5" OD x 12" high, 108" long x 3-1/4" wide container conveyor, with worm screw to star wheel in feed, 30" OD turret, 7" x 6" container pedestals, (8) 4" ID x 7-1/2" pistons, 1/2" OD nozzles set on 8" centers, drip trough, bottom up fill, no container / no fill with Warren Rupp, dual chamber, stainless steel P/D diaphram pump. Resina Model S-30, single head chuck capper, cap size: 13mm to 70mm and containers: up to 6" OD x 2-3/4 to13" high with proper change parts, 102" long x 4-1/2" wide, stainless steel container conveyor, cap hopper with pin wheel sorter, cap chute, cap button and transfer shoe, double container grippers and single tighting chuck. Tronics Model 3S3 P/S front, back and wrap, labeler label size: 1" to 8-1/2" high x 12" long and can handle up to 8" OD containers with 120" long x 7-1/2" wide plastic Delrin product in feed conveyor , 60" long x 1" wide top hold down conveyor, spacing wheel, aligning chains for container squaring, dual label heads with 9" high peeler plates and 16" long x 6" high side wrap conveyor. All mounted on base frames with separate control panels. Raque 4500 series, complete, stainless steel, tray denesting, filling, roll stock and heat sealing line with number trays per minute – depending on materials, application and line configeration. Line consists of: Raque Model 4504 tray denester with dual 36" long x 6" OD empty tray roller magazines, (2) head reciprocating pick-n-place, 120" long x 32" wide dual lane tray conveyor with fixed 6" OD pockets set on 8" centers, to 156" long x 32" wide dual lane feed conveyor to Raque Model 1284-12-1, dual head piston filler with 19" long x 18" wide x 20" deep stainless steel product hopper and a fill range per application with proper change parts, currently set with dual 6" long x 2-1/2" ID pistons set on 8" centers with Model 1148-45-1liquid depositor product feed pump. Filled trays, then conveyed by 118" long x 32" wide dual lane transfer conveyor to Raque Model 4503-1 dual lane, roll stock, heat sealer and die cutter with 108" long x 32" wide dual lane in feed conveyor with dual 6" OD fixed pockets, dual film mandrels with 19" long film roll on 4" core and 9" long x 6" wide pnuematic pressure, heat sealer and die cut-off each lane, film rewind and 48" long x 32" discharge conveyor. Control panels have CPU controllers with touch screen controls and start, stop, e-stop push button and statis light bar. Mounted on stainless steel base frames with height adjustable legs and interlock safety guarding. Evergreen, complete stainless steel, liquid yogurt bottling line rated from 90 to 300 bottles and 20 to 50 wraparound cartons per minute – depending on materials, application and pack pattern. Line consits of: MTC stainless steel gaylord container dumper, Pace 75 cu ft feed bowl with Pace Model Omniline M500SSD stainless steel bulk bottle unscrambling system to Evergreen / Ave Technoligies Model NHMLKEFS, 32 head, rotary, stainless steel concentrated sanitizing, rinse water system and CIP unit mounted on separte skid with controls and circulating system to be connected in house, 32 head rotary, stainless steel electronic flow metering filler with diaphram valves for accurate fills and 8 head rotary stainless steel chuck capper with magnetic clutches, external torque adjustment, cap sanitzer tunnel and cap feeder currently doing 38mm flat screw caps both set on 5" centers, enclosed environment, interlock lexan guarding and chamber flooded with class 100 HEPA air, and Aries Model 602 mulitipak wrap around, hot melt glue cartoner with finished product divider. Airveyor and delron belt product handling conveying systems through entire line. Remote control panel with Allen Bradley controller. DFE / KAAK, complete cookie and bar processing, sheeting and baking line with volumes, speeds and bake times per hour – specific to type and size of product being run. Line consists of Vurslag dual sigma blade mixer, APV Baker (3) roll rotary dough moulder with pre feeder, dough sheeter and 72" long dough slitter, metal detector, DFE (6) zone, 44 meter long x 1.8 meter wide, direct gas fired baking oven with metal band belt, with (6) top mounted heat zone controllers, to guillotine cutter and then to carmel depositor. Sollich 10 meter cooling tunnel, to Sollich continuous flow top and bottom enrober with 84" long x 72" wide stainless steel mesh conveyor belt, Sollich 40 meter long x 1.8 meter wide thermoflow air cooling tunnel has neoprene belt with liquid air heat exchanger. All mounted on base frames. CVC, complete tablet or capsule, counting, filling, capping and labeling line rated from 5 to 55 bottles per minute – depending on materials, application and product count. 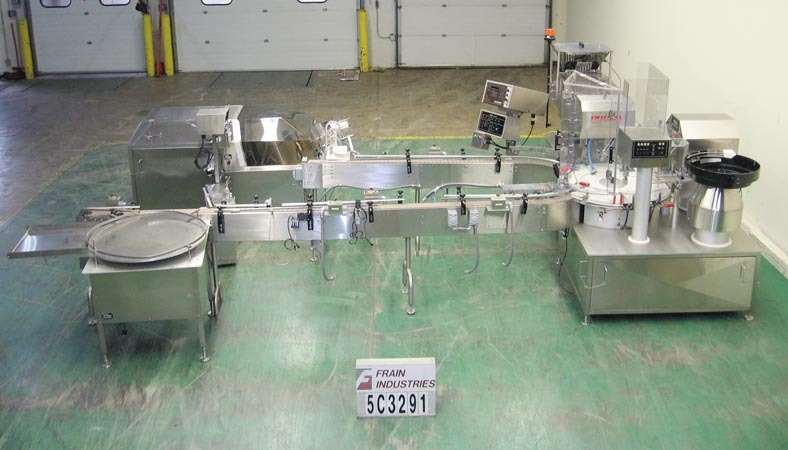 Line consists of King 36" OD stainless steel disc unscrambler, CVC Model 1220, track counter has 29" long x 16" wide product hopper with 3 vibratory feed trays and 12 feed tracks each tray, single sealed electronic count head and product discharge gate, touch pad controller with read out. Kapsall Model E4 (2) station 4 quill capper with 1/4" wide dual, double gripper container belts, control panel with spindle, hopper, gripper and cap feed controls, 20" long x 16" wide x 17" deep cap hopper with 48" long x 10" wide inclined cleated cap feeder set on 4-1/4" centers with 1/4" high cleats and 19" long discharge chute both with covers. CVC Model 300 pressure sensitive wrap labeler with bump wheel indexing, 7-1/4" wide peel plate, 15" long x 6" wide wrap station, 16" OD unwind and 7" OD rewind label discs with touch pad controller and readout, Kaps All Model FS-U-36, stainless steel 36" OD disc accumulation table for manual pack off. Line has total of 248" long x 4" wide plastic delron container conveyors with 36" in feed and discharge heights.